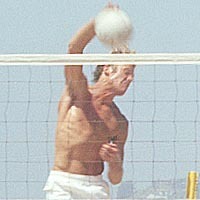 Andy "Fish" Fishburn first played beach volleyball, in 1963, when he was 8 years old, at "the beach club" in Santa Monica, next door to State Beach. Fishburn began his "Open" career at the 1977 "World Championships" with Fred Sturm, finishing second. In 1978 he entered 6 events with Sturm, reaching the finals each time, winning five of them. Fishburn�s most successful partnership began in 1979 with Dane Selznick. They played in a total of 38 events together, reaching the finals 28 times, winning 12 of them. He teamed-up with Jay Hanseth at 27 tournaments, winning twice and placing second seven times. Over the years, Fishburn also entered events with: Randy Stoklos, Tim Hovland, Todd Schaefer, Rudy Dvorak, John Hanley, and Steve Obradovich. Fishburn said: "The best part of beach volleyball is the "setting",ie the natural outdoors and the beauty of the beach and the ocean. In addition I like the ability to dive and innovate shots and plays, especially the touch and finesse of the game, along with the element of deception. His favorite tournament partner was Dane Selznick, because they could created an outstanding synergy as a team. Fishburn said: "The game that stands out most in his memory was the finals of the 1979 Cuervo World Championships, at Redondo's King Harbor." He and Selznick were playing Karch Kiraly and Sinjin Smith. After losing in the first round, he and Selznick came all the way back through the loser's bracket to qualify for the championship match. They lost the double final after winning the best two-out-of three match, forcing the final game to 15, by a score of 18-16, in complete darkness, with the entire crowd standing and screaming!